Ack! The storm woke me up, and I can’t fall back asleep, so I decided to write. It’s been raining nonstop over here, but I guess I can’t complain considering there are people who have to brave the snow on a daily basis. Anyway, there’s supposed to be a series of storms headed towards California. I don’t mind the rain at all. As a matter of fact, I LOVE it! 🙂 The sound of the rain is actually quite soothing. 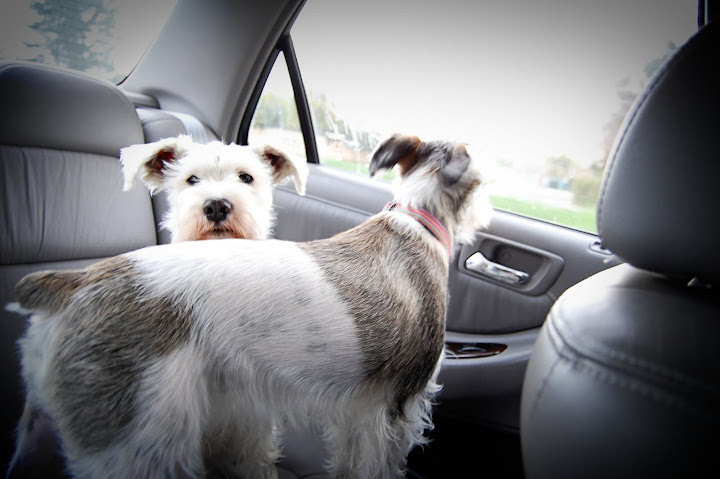 Maui and Hilo are completely frustrated by it though; they didn’t really get a chance to stick their face out the window on our daily errand run yesterday. "The rain is not nice; it won't let me stick my head out the window!" …and because it’s running cats and dogs over here, I finally finished making cards with leftover Hambly products that Memories Live On wanted me to create for their CHA Supershow booth. Oh, the joys of leftover scraps! …and here’s a layout I made just for fun. I love all the bright and vivid colors on this one! Oh, and I finally had the chance to draw a random winner for my giveaway last week. If you aren’t the winner this time, no worries! I do giveaways ALL THE TIME, so you’re bound to win sooner or later, right? …and the winner is Melissa! To claim your prize, please email me at redoaklines[at]gmail[dot]com, and I’ll ship a package filled with tons of scrappy goodness. Feel free to “jack” my sketches. I don’t mind at all. I use them to inspire me when I’m in a scrapbooking rut, so I thought why not share them with everyone else. To see more of them, click here! …and if you do use them, I want to see your work! If you’re going to be in Southern California, Jan 23rd, make sure to hit up the World’s Largest Crop Attempt. It’s going to be fun and filled with a bunch of giveaways! I know that Zutter is hosting a giveaway, and one of my projects will be in their giveaway basket. Yay! Off to fall back asleep with the sound of the rain. I love your sketch, hmmmm.. must find time to give it a try! I have to get my hands on that Hambly stuff! Your cards are so cute! 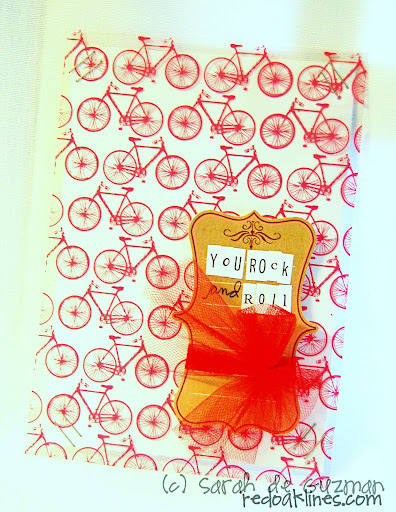 Love the Rock N Roll Card! but honestly, they are all great! Wow, I am loving everything here!! Those cards are very cool! Love ’em!! A few years ago I’d have to pay someone for this ionfrmaotin. 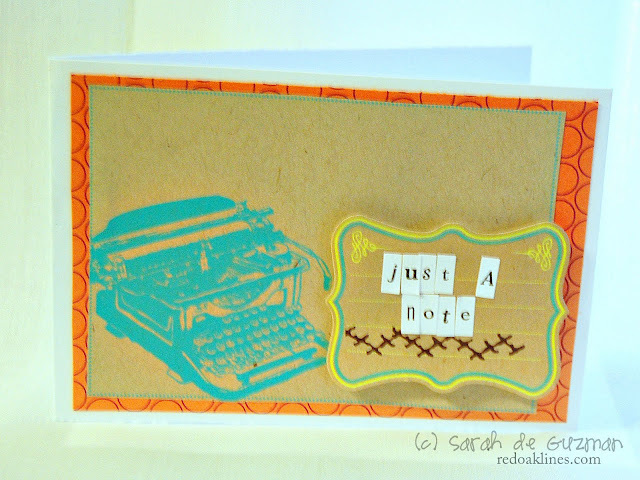 Oh, your cards are so wonderful, Sarah! Love everything! julie — when are you headed to CA?! 😉 can’t wait!!!! Greetings from the gym. No gal this morning. Which is a good thing. I’m on the bike today since I hurt my leg yesterday and I thought I’d say a good morning! Hope you get more sleep. Nice LO btw, but I swear you made more. Love your cards and layouts, the “family” one is simply gorgeous! I love your colorful fun and happy style, so unique!! I hope you were able to fall asleep again. 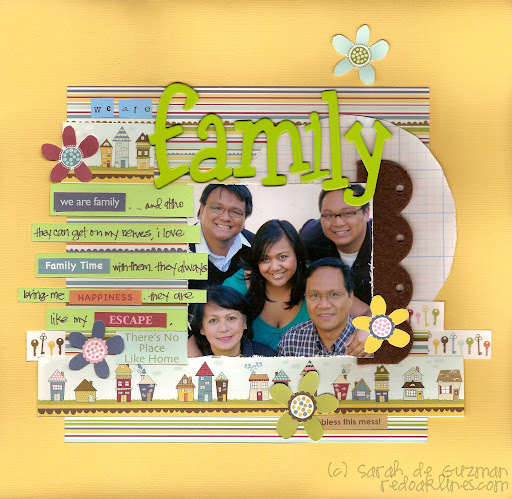 Love the ‘family’ layout!! Yikes! If my hair was that long in that Family LO, then it is totally a mess now! It’s raining like mad here too. When I woke up I took a look at the doppler and it was yellow and red less than 40 miles away, so I got dressed and got to work earlier than usual. LOL. I love the rain though! We need it too! That is the same sketch I used! 🙂 I uploaded my lo to sbc! 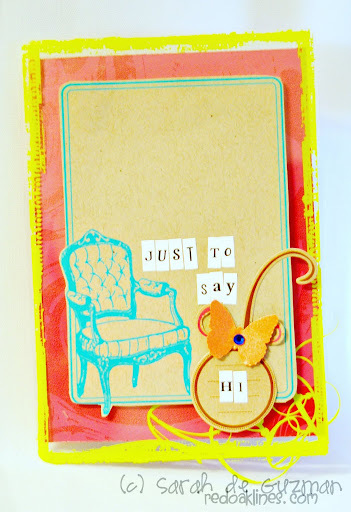 Love your cards, layout, and sketch! 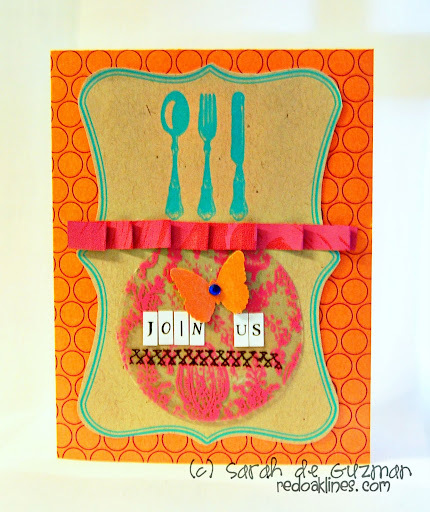 Great use of scraps! Hope you have a super time at CHA! Looking forward to seeing some pix. have a safe trip. Thanks for posting my layout…how FUN! I’m definitely going to check out more of your sketches. Oh wow Sarah I love your cards..loving left-overs! Loving that sketches of you! Wishing you lots of fun at the CHA!! oh my word, girl. those cards are so freaking cool! aw man, forgot bout that sketch….hmmmm…i got 5 days off….maybe i’ll try it out!!! happy stormy….i love stormey storms! Your cards ROCK!!! I love the fun colors!